Juan Williams: NPR Went After Me Because 'I Appear On Fox' : The Two-Way The news analyst's contract with the network was terminated after he made comments about Muslims that news executives felt didn't live up to the network's standards. He says he was fired for telling the truth. Saying that he thinks NPR terminated his contract because "I appear on Fox," news analyst Juan Williams tonight continued to protest the decision by NPR executives to cut the organization's ties with him. "I don't fit in their box. I'm not a predictable, black liberal," he told Fox News' Bill O'Reilly. NPR CEO Vivian Schiller, however, told executives of NPR's member stations that Williams' contract was terminated Thursday because he had more than once expressed personal opinions on controversial issues while offering commentary on other media outlets' shows -- most recently on Monday's edition of Fox's The O'Reilly Factor when Williams says he gets nervous when he sees people in "Muslim garb" on airplanes. Williams, who Fox announced Thursday would be taking on an "expanded" role with that network and had signed a multi-year contract, joined NPR a decade ago as host of Talk of the Nation and later became a senior correspondent. But he rankled executives with outspoken remarks on Fox News, where he was also a paid commentator, and in newspaper opinion pieces. In the spring of 2008, NPR shifted him from a staff correspondent position, making him instead a senior news analyst on contract. In 2009, NPR also asked Fox News not to identify him as an NPR analyst on screen -- most recently, after he described first lady Michelle Obama as being like the black militant Stokely Carmichael in a designer dress. Schiller compared Williams' dismissal to NPR's recent decision to ban news staffers from attending the upcoming Washington rally of political satirist Jon Stewart -- who frequently targets conservatives. She says it's important to maintain journalistic objectivity. She also on Thursday said that Williams should have kept his feelings about Muslims between himself, "his psychiatrist or his publicist" -- a comment she later said she regretted. "I spoke hastily and I apologize to Juan and others for my thoughtless remark," Schiller said in a statement released by NPR. O'Reilly said NPR was wrong to terminate Williams and that Schiller was invited to appear on the Factor. Using a word his viewers have heard him say many times when talking about guests he has criticized who decline such invitations, O'Reilly said it was "cowardly" not to accept. Listeners on Thursday deluged NPR with complaints, by e-mail and phone, while leading Republicans -- many with close ties to Fox -- called on Congress to withhold all funding for NPR. NPR receives about one percent of its budget each year directly from the federally funded Corporation for Public Broadcasting and a similar amount from the National Endowment for the Arts -- but public radio stations that purchase NPR's programming receive more federal dollars and send some of that money back to NPR in fees. The story of NPR's decision to terminate the contract of news analyst Juan Williams in the wake of comments he made Monday on Fox News Central about being nervous when he sees people in "Muslim garb" on airplanes takes another turn this evening. Williams will be on Fox's The O'Reilly Factor -- the same show where he made the remarks that kicked off the controversy. The Factor gets going at 8 p.m. ET. We'll update this post with news as it happens, so be sure to hit your "refresh" button. Afterward, we'll recap. Update at 8:25 p.m. ET: Williams earlier today made the point that he was "the only black male on NPR." During his discussion with O'Reilly, he added this: "I don't fit in their box. I'm not a predictable, black liberal." Update at 8:13 p.m. ET: Williams' time on the show appears to be over. While talking to Bill O'Reilly, he said he believes NPR was pressured to take action in part by an e-mail campaign "orchestrated by a Muslim-rights group." For the record, at the top of his show O'Reilly did show NPR CEO Vivian Schiller saying today that "this action was not anti-Fox ... it was pro-journalism standards. We're not picking on Juan." Update at 8:10 p.m. ET: "They were looking for a reason to get rid of me because I appear on Fox News," Williams says. Update at 8:07 p.m. ET: Williams says NPR took "something totally out of context" because during Monday's edition of the Factor he also spoke out about the need to be tolerant of Muslims. "Tonight we gave Juan Williams notice that we are terminating his contract as a Senior News Analyst for NPR News. "Juan has been a valuable contributor to NPR and public radio for many years and we did not make this decision lightly or without regret. However, his remarks on The O’Reilly Factor this past Monday were inconsistent with our editorial standards and practices, and undermined his credibility as a News Analyst with NPR. 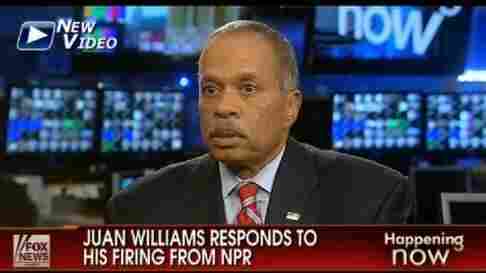 "We regret these circumstances and thank Juan Williams for his many years of service to NPR and public radio." "They have used an honest statement of feeling as the basis for a charge of bigotry to create a basis for firing me. Well, now that I no longer work for NPR let me give you my opinion. This is an outrageous violation of journalistic standards and ethics by management that has no use for a diversity of opinion, ideas or a diversity of staff (I was the only black male on the air). This is evidence of one-party rule and one sided thinking at NPR that leads to enforced ideology, speech and writing. It leads to people, especially journalists, being sent to the gulag for raising the wrong questions and displaying independence of thought." -- Harsh criticism of NPR from some high-profile conservative voices who accuse the network of liberal bias. They include former Alaska Gov. Sarah Palin, former House Speaker Newt Gingrich and former Arkansas Gov. Mike Huckabee.